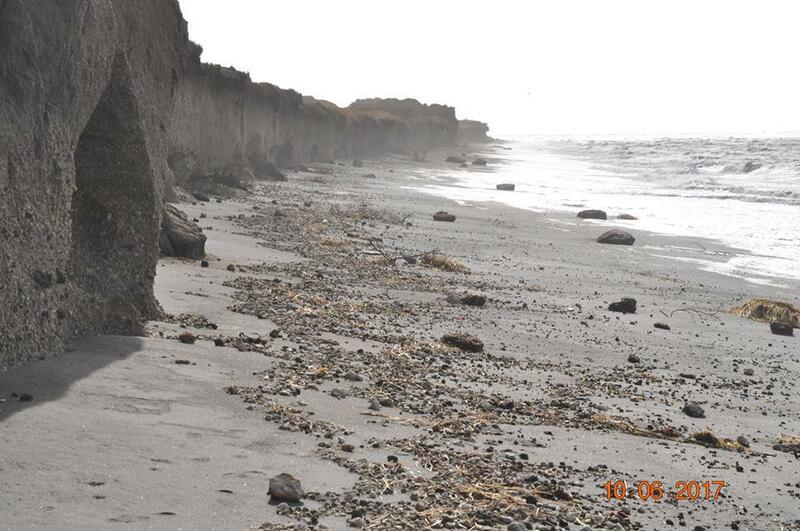 Some areas of Port Heiden's coast eroded six feet during storms in recent weeks. It's a problem the community has been dealing with for decades. Over the past week, several Bering Sea storms battered Port Heiden's coast. Bering Sea storms have hit the coast of Southwest Alaska hard in recent weeks. For the village of Port Heiden on the Alaska Peninsula, that has meant accelerated erosion. Trained monitors in the village measured six feet of erosion in some places from the most recent storms. Within the last year, they have measured twenty to one hundred feet of erosion along different sections of their coast line. Port Heiden has been waging a fight to stay above water for decades. They started building homes on higher ground away from Meshik, the old village site, in the 1980s. The last person moved out of the old village in 2008. First there was the issue of what to do about the old buildings. Left alone, they would have washed into the sea and the debris landed on Port Heiden’s beaches. Last year, before the road washed away too much to drive heavy machinery on it, the village deconstructed many of those buildings. “It’s a very hard thing to do. We’ve gotten a lot of backlash about it because it’s emotional, because it’s letting go of your home that you grew up in. But what other alternative do we have? We can’t stop the force of nature, but we can do something about leaving less of a foot print to our ecosystem by not polluting it,” said Christensen. Another issue erosion poses is the loss of a safe harbor. The current harbor is past the old village. As the road to it washes away, fishermen say they are working on identifying a new place to park their boats. Finally there is the issue of continued erosion, even in the new town. The homes where people live now, the village office and the village store are currently on stable ground. However, to get from the bluffs where the town lies to the beach where barges land and residents subsistence fish, the village has to regularly reconstruct beach access roads with a loader. More worrisome, erosion is getting to the roads near the school. Christensen vividly remembers a day several years ago when water flowed across road, separating the school from students’ homes. One school bus drove children to the flooded area. Then adults walked or carried the children through the water on foot. Another school bus picked up the students on the other side and took them to their homes. Port Heiden’s fuel tank farm was relocated fewer than two years ago due to erosion concerns. But Christensen worries that its new position by the school might not keep it safe from erosion for long. Even as the village continues its march inland, the community seems more focused on answers to the problems erosion causes than on possible causes of erosion. Whatever the cause, Christensen is optimistic that the community will stay motivated and find solutions. 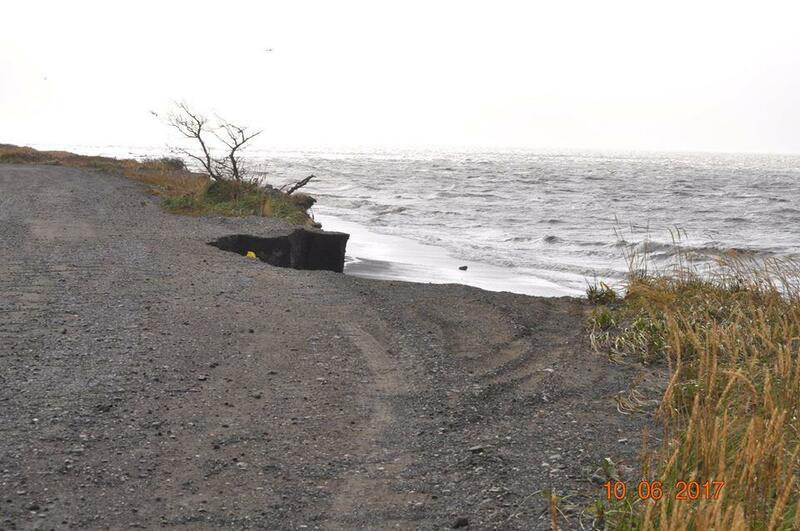 Erosion is eating away roads around Port Heiden.